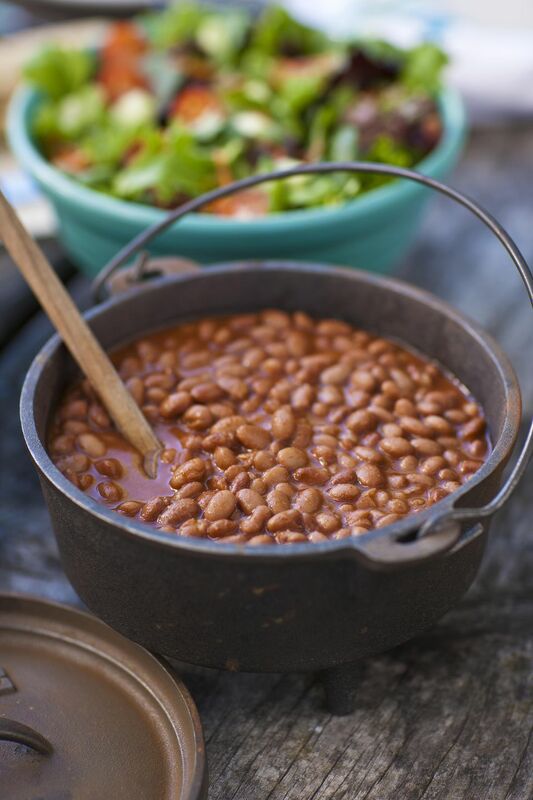 These baked beans get their flavor from Brisket Burnt Ends. These are the dried out tips of a smoked brisket. Burnt Ends are a little tough on their own, but the perfect addition to beans. Soak beans for 4 hours in water, then drain. Combine beans and 6 cups water in a large pot. Bring to a boil then reduce to a simmer. Cook for 2 to 3 hours on a low heat, stirring occasionally. After the beans have softened add salt and continue cooking until the beans are soft enough to mash between your fingers. In a skillet fry the bacon. Remove the bacon and add the chopped onion and peppers. Saute until soft. Crumble bacon. Place the onion and peppers with the bacon in a Dutch oven or baking dish (though a Dutch Oven works best). Add all remaining ingredients and cover. Bake for 1 hour then remove the cover, stir and continue baking for about 15 minutes.